I am a pecan pie naes-sayer. They are overly sweet and gooey, and if they aren’t cold they kind of ooze all over you with their sticky nutty mess. That being said, my mind was recently changed by my friend, Laura. I went over for a day of goofing off downtown and baking. I was pleasantly surprised by what popped out of the oven (she makes the best baked goods). We made pecan pie bars, with a large smattering of hazelnuts in them. Their sweet scent filled the apartment, and they came out quite tasty. So I took that delightful bar recipe she found on allrecipes, and changed it into something that looks nothing like the original. Mix together the flour, butter, salt and brown sugar in a food processor, or by hand until the ingredients are reduced to crumbles. Add in the water, mix it into the dough, and press it into a lightly oiled tart pan. Its too sticky and soft to roll out. You’ll just end up using all your swears otherwise. For the pecan pie goo. Preheat the oven to 375 degrees, whisk the eggs with the sugar, corn syrup, salt, and vanilla extract. Add in the coconut, pecans and hazelnuts, and pour that into your tart pan. Bake for 40 minutes, or until when you give the pan a light shove it no longer undulates a wave of goo. Just use dark or semi sweet chocolate, this thing is already teaming with sugar. The slight bitterness of the dark chocolate is a welcome additive to the to the salivary gland squeezing sweetness of this tart. On low, melt the butter. Add in the chocolate chips and stir until they are melted and combined well with the butter. If you’re a neanderthal like me, pour it into a plastic sandwich bag, seal the top, a cut a small hole in one of the corner. Drizzle that over the top of your pecan pie once it pops out of the oven, and let it cool for at least an hour. Your version looks so delicious! 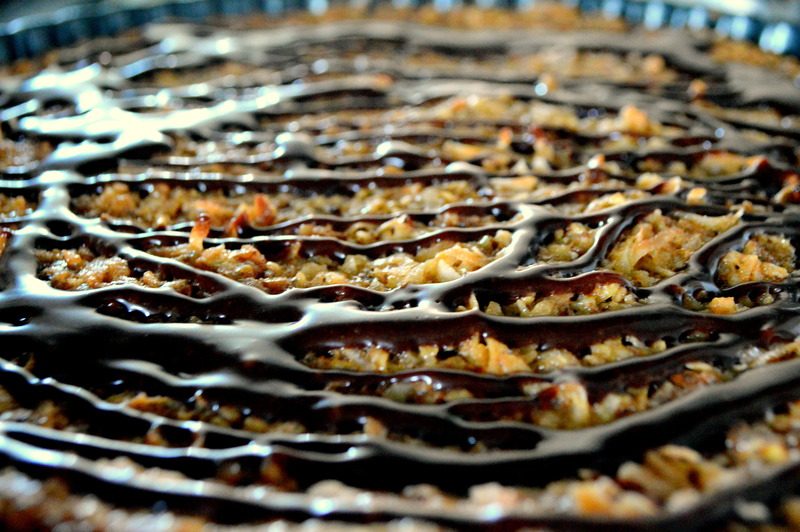 I’ve thought about those yummy bars we made on a regular basis…. haha! thanks for liking my most recent post, I thought I’d stop over, and I just need to say that your pecan pie commentary is on point!! I do the exact same thing where I shake to check for undulating goo waves.. I need to try this recipe sometime! It’s the only way to make sure it’s not goopy. Thanks for stopping by!